George Pocock and the Beginnings of Modern Traction Kiting. One of the more athletic and daring aspects of the modern kite scene is the emergence of kite powered buggying as a means of combining the pull of dual and quad line power kites with wheeled vehicles. Peter Lynn’s tricycle buggies, first seriously marketed in the early 1990’s, have taken adventurous kiters into new dimensions of speed and motion. Lynn’s vehicles have been copied by numerous hobbyists and even a few other commercial ventures. When combined with proper safety precautions the thrills and exhilaration of a kite-powered buggy ride can be quite addictive to daring kiters. History points to George Pocock, a school teacher and inventor from Bristol, England, as one of the pioneers of wheeled traction kiting. Born in 1796, Pocock was a kite enthusiast from the time he was a child. He frequently played with kites and became skilled in their construction and flight. He first experimented with the pulling power of kites by attaching small stones to them to determine their ability to tow varying weights over distances. 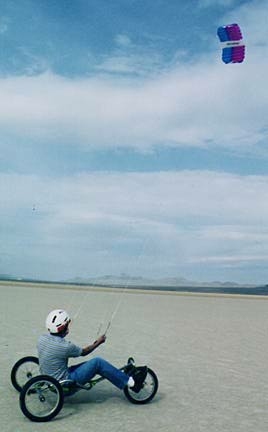 As Pocock moved into adulthood and the teaching profession, he continued to be fascinated by kites and their power of lift and traction. Pocock often used kites in his work with the students at his school. In 1820 he demonstrated that kites, rigged in tandem, could pull reasonable loads for considerable distance. Using kite trains of undocumented numbers, his students observed large boards and planks being successfully dragged along the country roads. Keeping careful notes of his work, Pocock determined that under certain wind conditions and with kite sails of the proper size, considerable lift could be generated. He conducted numerous lifts and felt secure enough in his knowledge to begin lifting passengers on his kites. In 1825, he lifted his own young daughter, Martha, on a specially rigged chair attached to one of his larger kites. The kite itself had a canvas sail that was thirty feet high. Raising her to an altitude of between 90 and 100 yards and returning her safely to earth, it is said that young Martha expressed much pleasure about her ride. Later that same year, using the same device, Pocock sent his son to the top of a rather steep cliff on the Bristol coastline. At the summit of the two hundred foot cliff, Pocock’s son dismounted briefly and then climbed back into the chair. Opening a restraining clasp the device slid down the line back to the anchor point. Pocock appeared to turn his attention from using kites for lift to using them for traction shortly thereafter. It is not clear as to why he did this, but records of his feats from this time on center on his work with using kites as a traction system for vehicles. Using small wagons, he learned that several kites of large size created the necessary pull to move the gross weight of carriages with passengers. 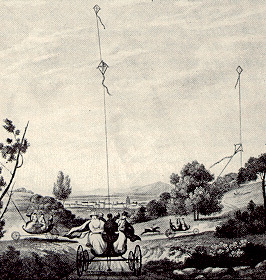 He also found that it was necessary to devise control devices to maneuver both the kite lines and the carriage to keep his contraptions on course. By 1826 he had patented a new vehicle specifically named the Charvolant (from the French char for carriage attached to volant from the French term for kite: cerf-volant). The lightweight Charvolant featured large wheels to facilitate easy forward rolling motion thus minimizing the required pull of the kites. The device was designed to carry the operator and up to three passengers. Two very large canvas kites rigged in tandem were the source of power. The kites had an arch top, a shape that was popular in England at the time. Pocock had also devised a framing principle for the kites which permitted them to be folded using an umbrella like mechanism when they were not in use. They were then stored in the vehicle for later use as required. To control these “buoyant sails” as he referred to them, were four lines which controlled lateral movement and the overall length of the line played out to accommodate the wind. These four lines were wound around revolving spools which were controlled by the driver. Steering the Charvolant was accomplished by a T-shaped steering bar attached to the front wheels of the unusual carriage. To ensure that he could stop the device, Pocock installed an iron bar brake lever which simply pressed into the road when it was raised by the driver. It must have been quite a feat to manage the operation of the device keeping in mind not only staying on the rudimentary roads of the day, but also avoiding obstacles such as trees, church steeples and tall buildings. Pocock records that on his first test, his kite-drawn carriage reached an estimated speed of 20 miles per hour and overtook a horse-drawn carriage belonging to the Duke of Gloucester. In 1827, during a demonstration for King George IV, Pocock’s Charvolant was able to journey from Bristol to Marlborough easily overtaking the London mail coach following a similar route. Later, he took a 113 mile trip across the British countryside to attempt to demonstrate the reliability of the vehicle as a means of travel. Pocock wrote one book on his work with kite traction and lifting capabilities, The Aeropleustic Art, of Navigation in the Air by the Use of Kites, or Buoyand Sails, published in London in 1827 and again in 1851. However he tried, Pocock was not able to make a commercial success of his device and it remains as one of the more interesting sagas of the attempt to harness kite power for useful travel purposes. Although Pocock is not the first to use kites for purposes of traction (examples of kite traction on sea-going canoes exist in drawings and oral history dating back to early times in the south sea islands) his attempts to harness kite power for transportation are considered to be one of the most carefully recorded and documented in the mid-1800’s. Appreciation is extended to the Bettman Archives for the engraving of the Charvolant. This entry was posted in 1998, Issue 5 (Sep/Oct), KL Archive and tagged buggy, history, kite buggy, lifting, traction.